iTunes backup is a special format file, which doesn’t allow anyone to access or preview. But it doesn’t mean we can’t extract and recover data from iTunes backup. iFonebox give the best solution to access contents of iPhone/iPad/iPod backup files to recover ios data. 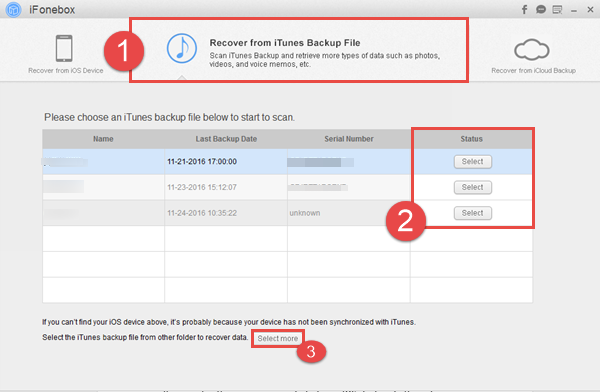 It’s very easy to use, only three steps you can view all details of your iTunes backup content. Now please follow the steps below to recover your Photos, Messages, Contacts,Call history, Notes, Calendar, reminder, Voice memos, etc from iPhone/iPad/iPod backup. Free download iFonebox for Windows and Mac by clicking the icons and then install it on your Mac or PC to have a try! Here we use iFonebox for windows as an example, if you are running a Mac, you can get iFonebox for Mac and do the same operation as below. Launch iFonebox on computer and you’ll get the window below. Please select the “Recover from iTunes backup”. After scanning finished, all files in iTunes backup are extracted including camera roll, contacts, messages, notes and so on. You are allowed to preview the contents of all files. Then choose what you want and click “Recover” to save them all on your PC as readable files. This program also enables you to recover data directly from iPhone/iPad/iPod. 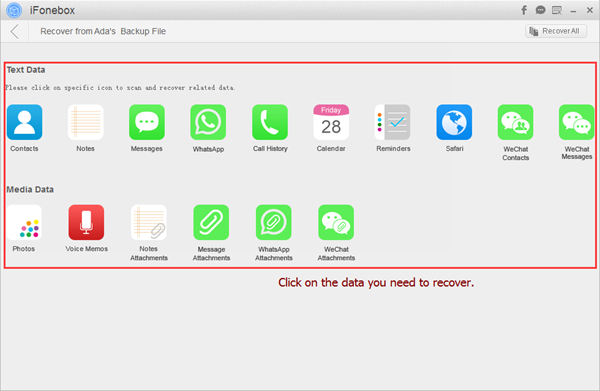 If you accidental deleted or lost some important data and you have no backup files, you can use this software to directly scan you Phone/iPad/iPod to recover contacts, message, notes, calendars, reminders, etc.